Dr. Amanda Hickman earned her Bachelor’s Degree in biology from the University of New Orleans in 2006. She earned her Doctor of Optometry Degree from the Southern College of Optometry in Memphis, TN in 2010 where she received training in ocular disease, primary care, pediatric eye care, contact lenses, and vision therapy. 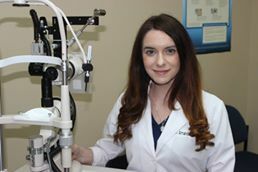 She has extensive training in family eye care, including pediatric eye examination, contact lens fittings, ocular disease and surgical co-management. She is a member of the Optometric Association of Louisiana and the American Optometric Association. Dr. Hickman enjoys spending time with her husband John and three children John III, Abigail, and Ellie. Dr. Hickman is committed to helping you and your family achieve their best visual potential.